Introducing a piece from the monastic armory: the Crescent Moon Spade. 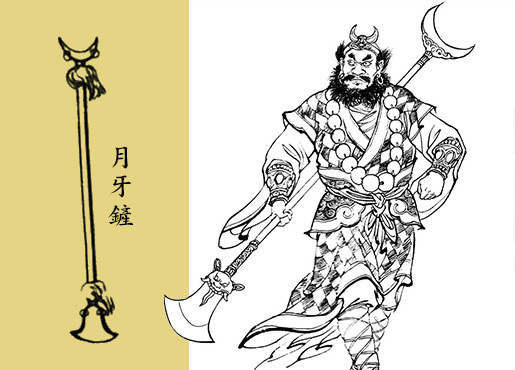 The Crescent Moon Spade (月牙鏟, or yuè yá chǎn) is a fusion of a flattened garden tool and a modified sickle, and is considered a Chinese pole weapon. Curiously enough, this was originally an instrument of peace, not murder. 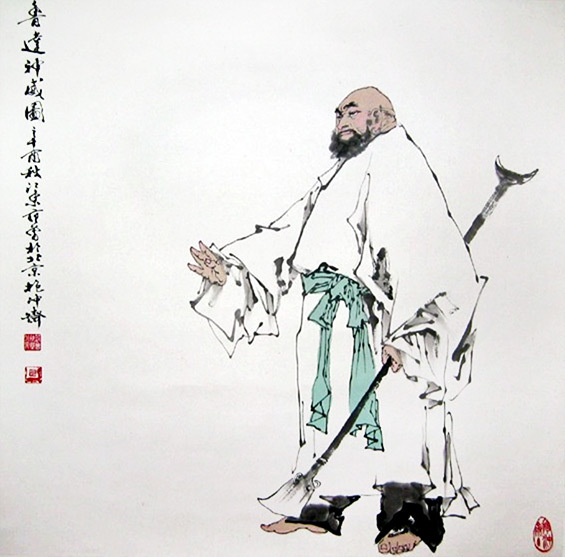 Traveling monks in ancient China carried around its predecessor—the Convenient Spade (方便鏟, or fāng biàn chǎn)—to fulfill the monastic responsibility of performing burial rituals for any dead they encountered in their wanderings. The Spade’s three defining curves represent the Three Powers of traditional Chinese cosmology (Heaven, Earth, and Man) and the Three Treasures of Taoism (essence, qi, and spirit). In time, a crescent blade was added to the opposite end to push away animal predators by the neck without killing them. 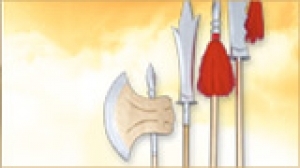 The Crescent Moon Spade’s versatility allows its master to hook, stab, scoop, sweep, smack and chop at opponents using techniques from spear, staff, broadsword, and trident fighting styles. 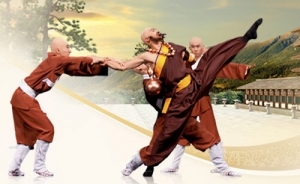 Nowadays, Shaolin and Taoist monks are the primary users of this double-sided weapon. 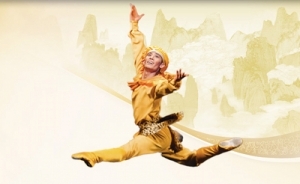 And so it became the weapon of choice for Sandy, who needed it to protect the Buddhist Tang Monk on his dangerous pilgrimage, and for Lu Zhishen, who showed fierce loyalty to his hapless band of brothers.